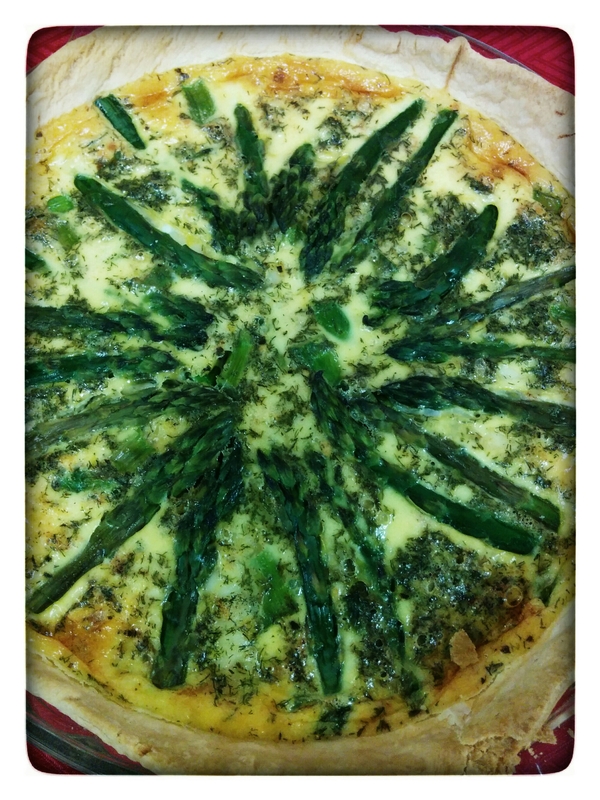 Asparagus Havarti Quiche, ready to be taken from the oven. 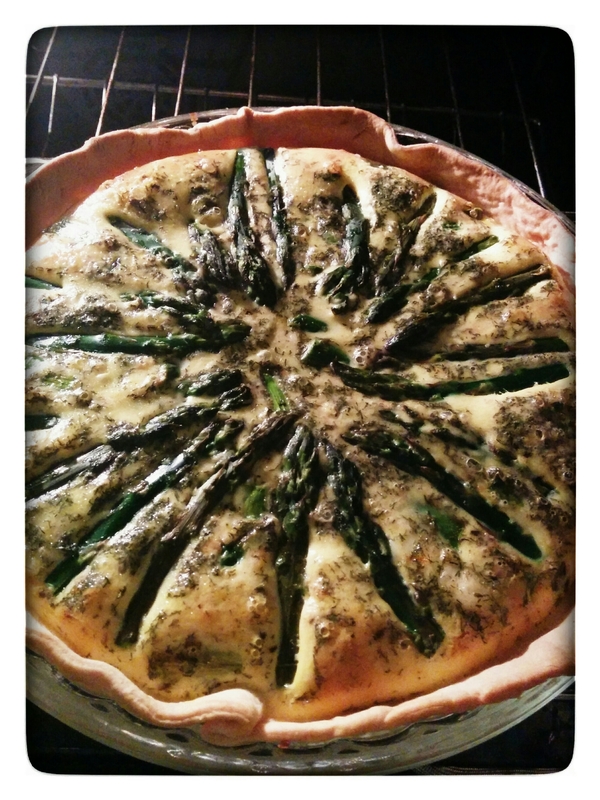 This is one of my all-time favorite quiche combinations. Have crust refrigerated according to package directions. 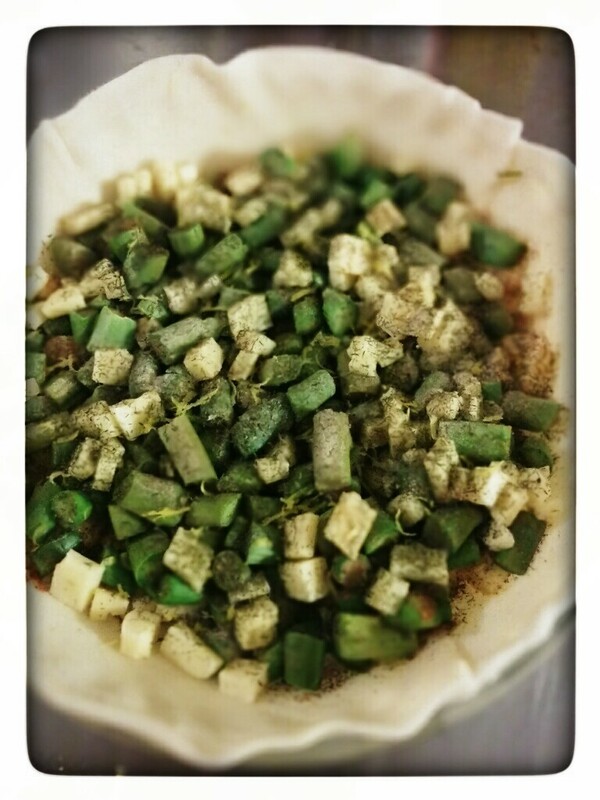 I do not find it necessary to pre-bake a quiche crust. The egg cooks; what is there to leak out? Anything that leaks out, is going to cook. One step to help prevent any leakage, though, is to put cheese as your first layer. This will help form a bond of cheesy goodness to help keep it all in. Too cheesy? Oh well, it works. Lay the pie crust in your pie plate. Prepare the asparagus. If you have thick asparagus, discard the tough stems and chop the remaining stems to whatever bite-size pieces you like. Cut the tips to a desirable length, and reserve them. If you have thin asparagus, you will not want to chop the pieces as small, but probably in 1-inch pieces. Again, however, reserve the tips. I like to use a steamer to cook the asparagus. Place all the stem ends in first, and place the reserved tips on top. Let steam for about 5 minutes (or less, depending on thickness). When they are bright green, they are usually done. Remove from steamer and let cool, and dry. You do not want to introduce extra moisture to the quiche. A quick toss with a dry towel or paper towel can remove any excess moisture. While the asparagus is steaming, dice or grate the cheese, whichever is easiest for you. Havarti melts fabulously, and finding those little nuggets of cheese is actually a good thing, even in a cold quiche. Havarti is not like cheddar or rubbery like mozzarella. I like to start with the cheese, then the asparagus stems, then cheese, then the remaining tips. Any leftover cheese can go on top. Sprinkle the Cajun seasoning, the lemon zest, and the dill evenly over the quiche. Arrange the reserved asparagus tips artfully (as you desire) over the top. In a 2 cup measuring cup or bowl, mix well the eggs, egg yolks, milk, cream, salt and pepper. Pour over the quiche. Bake in a preheated oven (350 degrees) for about 40 to 50 minutes. It should be puffy and set in the middle, with a nice golden top. 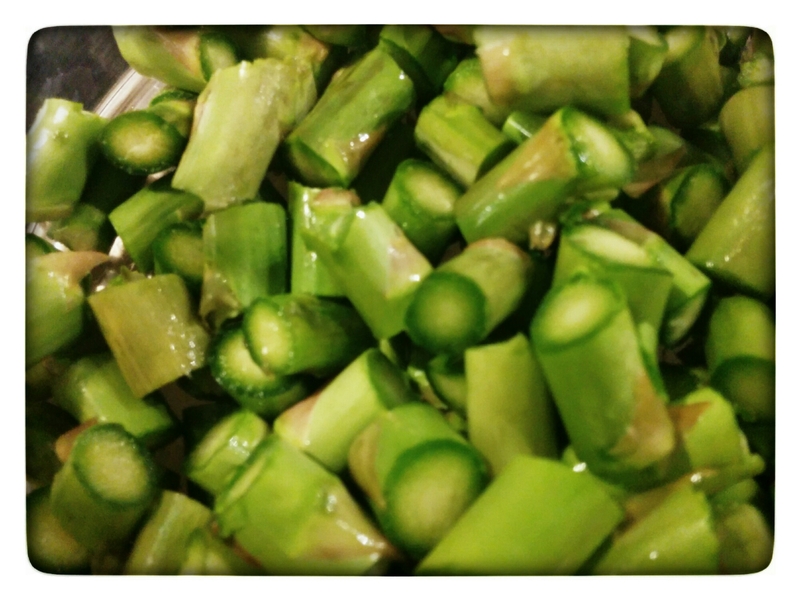 Fresh Asparagus stems, ready to be steamed. Chopped and steamed asparagus with chunks of havarti cheese, dried dill, lemon zest, and cajun seasoning. Ready for the eggs and cream. After adding the seasoned eggs and cream, you can (or not), artfully arranged the reserved asparagus tips to your liking. I like a sunburst design as it just another sign of spring. 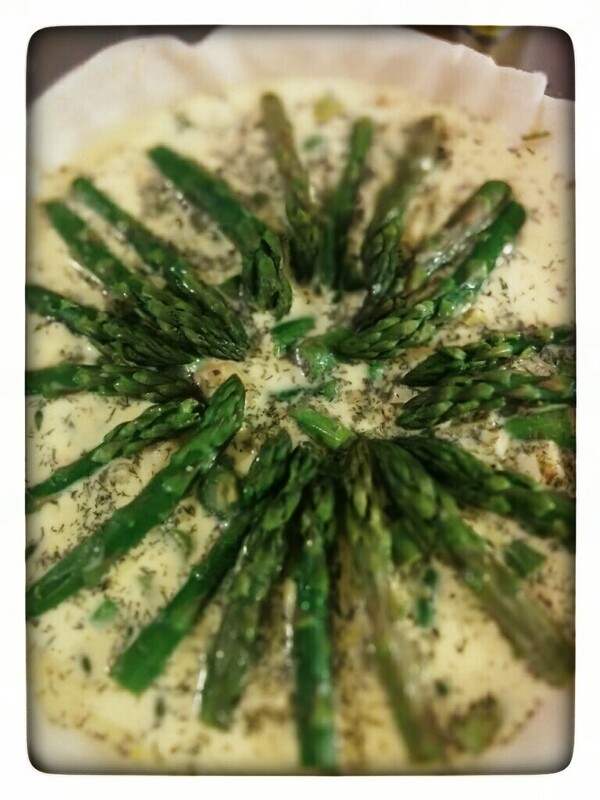 Asparagus Havarti Quiche, on the serving table. Seems like it’s the season for quiche! I love the idea of using the asparagus stems and spears separately, to make the best of both. Looks delicious!